If you still don't believe it, then try out the cupcakes in Darjeeling for once to figure out what passion can create. Anjita Pradhan originally hails from Darjeeling. Having done her schooling at Loreto Convent here, she went to Bangalore for higher studies. Following graduation, she moved to Nepal and worked in establishments like Himalayan Times. Later she moved back to Bangalore and joined Yahoo! Gradually her inherent love for baking started pushing her to rethink about how she wanted to pursue her profession. She has been baking cupcakes & cakes for her friends and family for quite a while now. She got her first cupcake order from friends in Yahoo during Valentine’s Day and there was no stopping after that. One of her colleagues signed her up for an event to sell cupcakes and that was the first time many other people got to taste her cupcakes. She received a lot of appreciation and everything sold off like hot cakes. And a professional cake maker was born. Her first big order was for a birthday and she had to make 100 cupcakes in a day and deliver it. Eventually she decided to move to her native place Darjeeling and start making the goodies as her full time profession. This is what Anjita wrote when she contacted me for the first time: "Hi Raj,... I quit my job to follow my passion which is baking. I have been baking cupcakes and cakes for my friends and family for a while now. I am a huge fan of cupcakes myself. 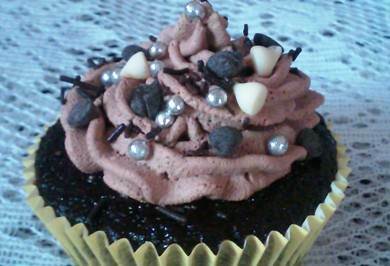 I feel people here in Darjeeling are missing out on cupcakes when they have already become a rage all over the world. I did a small research but I could not find a place where they sell these heavenly goodies. So to put it in a nutshell I really want people to taste these...". Having understood her process, the ingredients she uses and the personal care she takes, I have no doubt that it would soon become a rage in Darjeeling as well. These little pieces of heaven are freshly baked at home only when people order and do not contain any preservatives. The process is the same as making cakes. However it’s the ingredients she uses that makes her cupcakes different because there's a lot of effort in choosing the right ingredients. And then comes the creativity in making something that stands out and that looks and tastes "different". She puts in the best and that is what makes her cake different from the rest. Moreover it's home baked with much love and care, and that shows in the cakes. She got most of her baking items from Bangalore when she moved to Darjeeling. She didn't know where to source them here. She would continue to source the ingredients from Bangalore till the time she finds a quality local distributor. Since these are homemade goodies, the pricing might look a little on the higher side. But since she does not compromise on the quality of the ingredients, I personally think that the price should not be an issue when you are looking to taste the best homemade products. When there's quality, there's got to be a small price tag. However, she can negotiate on the prices if the volume of the order is high. 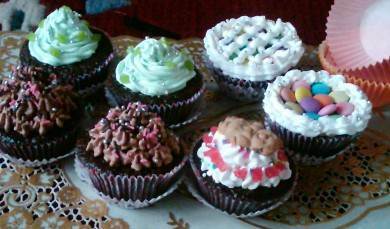 She also bakes eggless and sugar free cupcakes on special orders. She takes cupcake orders for birthdays, corporate events and weddings as well. First of all, you will need to call her up and order the cupcakes at least one day in advance because she will make it fresh for you. Also note the minimum quantity for order is 12. 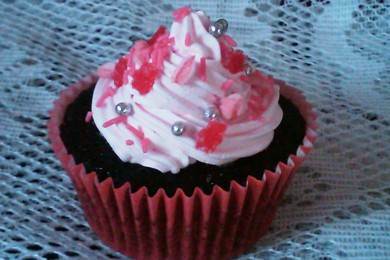 If you are a local of Darjeeling and ordering the cupcakes for your home or office, she will let you know about how the cakes would be delivered depending on the quantity and location of delivery. If you are a tourist, she will hand over the nicely packed cupcakes to you at the Chowrasta Mall and in front of the CCD (Cafe Coffee Day) at a mutually agreed time. UPDATE January 2014: Anjita is unable to offer cupcakes until further notice.